Apparently, Microsoft decided that a great way to get people to stop using Google and to start using their MSN search engine was to hire three annoying guys who hawk products on late-night infomercials: Matthew Lesko (Free Money to Change Your Life), Tony Little (Gazelle Freestyle), and Anthony Sullivan (Swivel Sweeper). Two of which, we are proud to say, have had their infomercials featured on the Ridiculous Infomercial Review. MSN is calling this promotional effort Infomercial Madness and has a Flash website featuring the infomercial pitchmen. The website features videos by all three in which they parody their infomercial personas in an effort to let people know all about the glories of MSN Search. 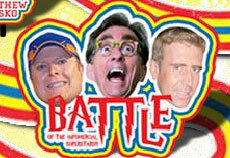 You do have to give credit to Lesko, Little, and Sullivan for being able to laugh at themselves, especially in the “Battle of the Infomercial Superstars” video, which makes all three gentlemen out to be even bigger buffoons than they probably are in real life. The Infomercial Madness site also includes a “Match Game,” which is like that old memory card game you played as a kid but here the cards feature weird pictures of Lesko, Little, and Sullivan and when you successfully match the cards the characters shout out an obnoxious catch phrase. But probably the best thing on Infomercial Madness is “Make Your Own Infomercial” in which you choose one of the men, select various phrases for him to say, and then watch a video of the result. It’s sort of a Mad Libs for infomercial junkies. Aw, too bad they got rid of that site. Sounded awesome.